there was a WALGREENS FLYER in my sunday paper! apparently windham, bath, & norway all have functional walgreens in their neighborhoods, but i’ve never actually been in one. they’ve been building one on forest ave. for months now- and it looks like it’s almost done! people who coupon seem to love it, but i have to say that i’m a little scared. the flier looked to have some pretty excellent deals in it, and from what i can tell, the register rewards system works pretty much like the CVS extrabuck system… although i’ve heard rumors that it isn’t as consistent (rewards don’t always print out like they’re supposed to). should i be afraid? should i be excited? should i make my hot and dirty affair with rite aid exclusive and tell everyone else to go screw? the drama! I think you will like it. They always have good sales like BOGO on different cosmetic lines every week. At least ours does. 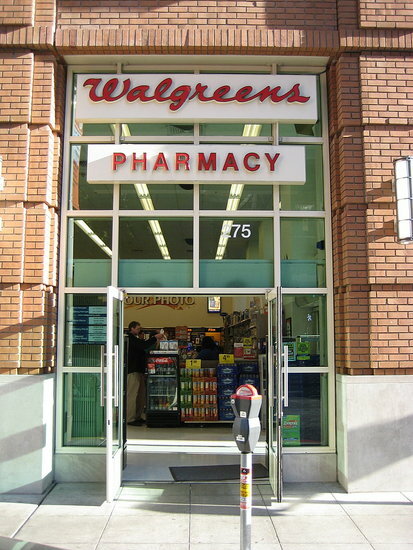 Their store brand pharmacy products are good and are often on sale. They have sale flyers by the front door with coupons and you can go to their website to see the weekly sales. Happy shopping! The deals are a little harder to work especially if you use the register rewards to pay for things. 1-have more items than coupons and register rewards added together or it will deny the register rewards. So lots of times I will look for clearance things (that I can use) or a couple single pencils. Also if say you buy a shampoo and get a register reward you can buy another shampoo with that register reward but you won’t get another register reward. I find them hard to work. But if you are so unhappy with CVS then it may be a good change for you. that’s exactly why i’m scared! a whole new system to learn! but thank you for you tips, i’m sure in time (just like cvs and rite aid), i’ll figure it out.